This completely revised edition of Energy Law and the Environment has greatly expanded its scope to explore how international law engages with multinational companies regarding energy sources, ownership of those resources, and state sovereignty. Written for all the players in the energy sector, lawyers and non-lawyers alike, this second edition has been aptly renamed International Law for Energy and the Environment. It considers issues of energy sector regulation related to economics and protection of intellectual property associated with development of technologies for mitigating environmentally damaging emissions. The book is divided into three sections that build upon each other. 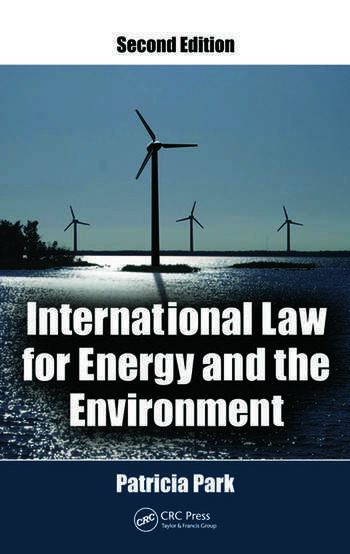 Section I addresses the interrelationship between international law, environmental law, and the energy sector. It covers regulatory theory within an economic context; the regulation of multinational companies with regard to international regulation and state rules; and trade, competition, and environmental law in the energy sector. Section II examines the regulation of the various energy sectors—oil, gas, and nuclear—and how international law affects them and their ownership, risk, and liability. Section III considers some of the main energy producer/user jurisdictions where energy companies operate, including more developed systems around the world, such as the United States, the European Union, the United Kingdom, Norway, and Australia as well as two major emerging economies, namely, India and China. The final chapter reviews the material presented in the book, drawing conclusions about the current state of environmental regulation in the energy sector and identifying potential future developments. How do You Develop a CCS Regulatory Framework? Patricia Park is a research professor at Southampton Solent University, United Kingdom. She was previously head of the Law Research Centre for 12 years. Patricia has carried out research for international oil companies, the United Kingdom, and German governments, and specialises in the regulation of industry, in particular, the energy sector. She has worked and carried out research in the United States, Sweden, Norway, Germany, Belgium, and India. She is a Fellow of the Energy Institute and a member of the International Bar Association, and was appointed as an original member of the Regional Environmental Pollution Advisory Committee to the newly formed Environment Agency in 1996. She was appointed a member of the Commission on Environmental Law of the IUCN in 1995. Patricia has published and lectured extensively in both the environmental and energy areas. Patricia has been a Magistrate since 1982. Duncan Park is the intellectual property manager at Leogriff AS, Oslo, Norway. He was recently leading counsel at Statoil ASA, Oslo for four years and prior to that was IP Counsel at Schlumberger WesternGeco. Duncan has worked both in private practice as a patent attorney and as in-house counsel, both in the United Kingdom and in Norway. He specialises in the strategic development of intellectual property rights, mainly within the energy sector, providing advice to technical and commercial departments. Duncan’s first degree was in mechanical engineering. "… a welcome addition to a rather limited list of law textbooks which deal with the energy industry. … Written in a very approachable, but at the same time expert and authoritative manner, the book is a must-read for anyone wishing to be involved in the energy business, particularly in the upstream sector. It covers a rich range of topics, not only limiting itself to principles of international energy law, but focusing on individual energy sector and using case studies from a number of different jurisdictions, reflecting the diversity of issues and challenges faced by energy market participants." "Everyone dealing with energy and environmental law issues should have this book on his or her shelf! On the one hand, it provides the reader with an excellent overview on current issues of international environmental and energy law. On the other hand, it gives an insight on well chosen specific topics such as the oil and gas sector, CCS or the legal situation in various countries including emerging states such as China and India. This makes it indispensable not only for academics, but also for practising lawyers in the growing field of international energy and environmental law."